Located on North Washington at the southeast corner of N. 8th Ave., Borough is pleasing to both the eye and the palate. The interior is beautifully designed with dark woods throughout and leather and plaids cover the chairs and banquettes. The chandeliers include converted graters and antiqued copper shades illuminating the space with a soft and inviting light. 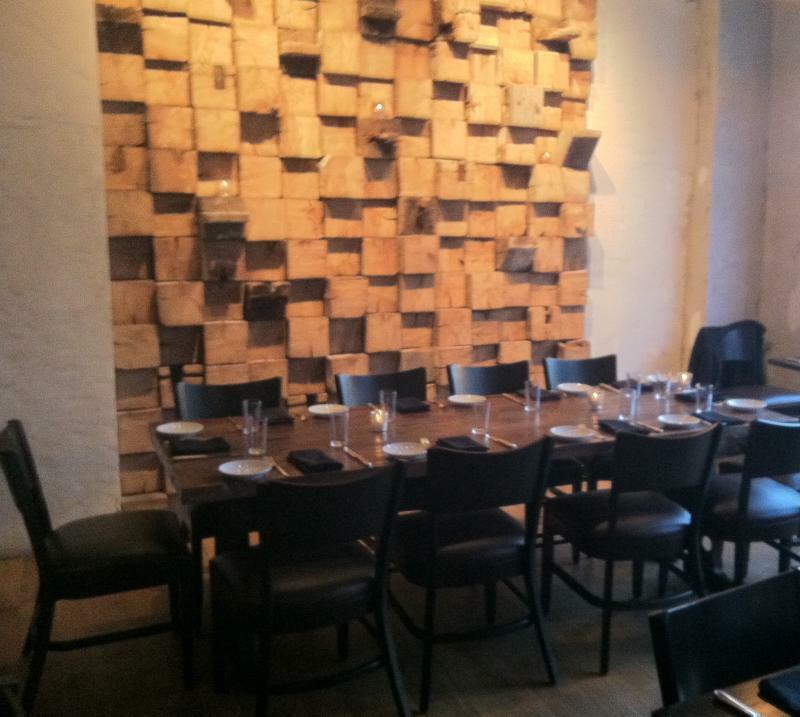 Mirrors adorn a tiled wall, a large collage of distressed 8×8 railroad ties cover the far wall with a long highly polished reclaimed wood table under the railroad ties. 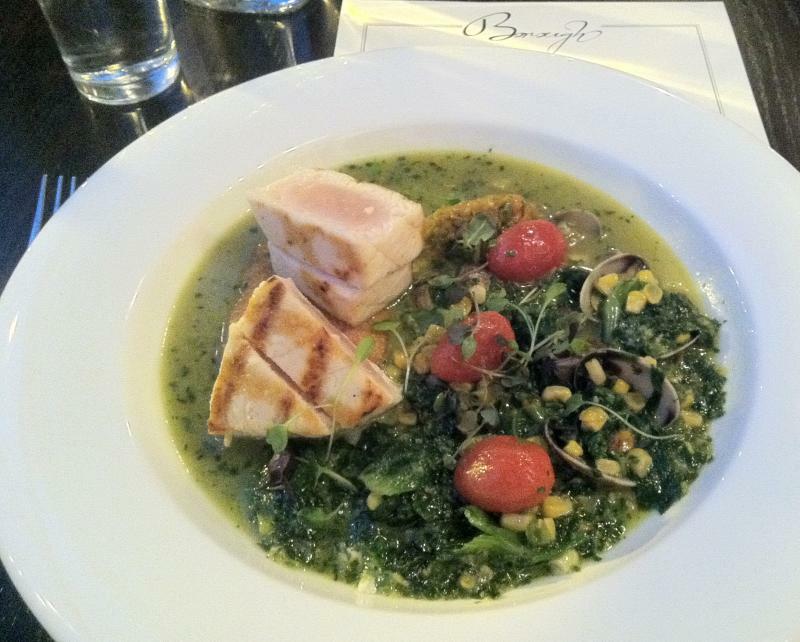 On my initial visit I ordered two dishes, the “Pork Belly” for an appetizer and the “Swordfish” for my entrée. 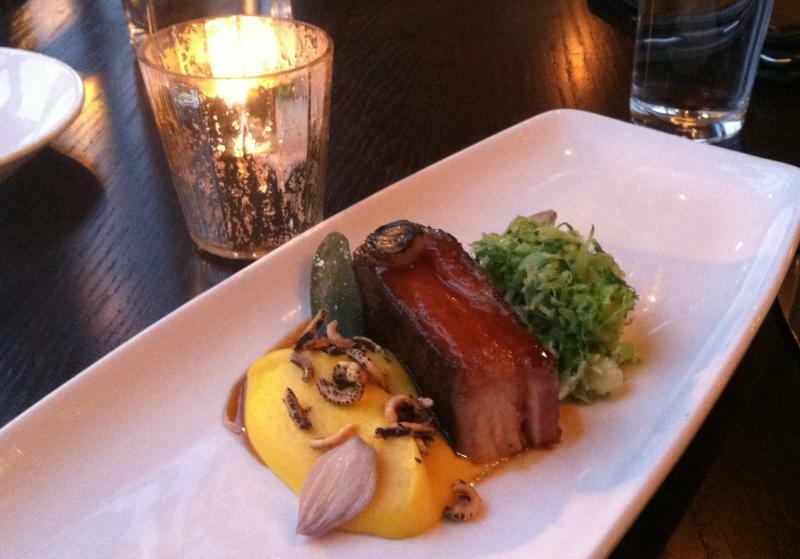 The “Pork Belly” was served with butternut squash, Brussels sprouts, wild rice and maple. The pork belly was two separate preparations in one piece; one side was succulent and delicious with a touch of BBQ sauce, while the other was a little over-salted and not as satisfying. The butternut squash was creamy and delightful and worked perfectly with the crunchy roasted wild rice that sat atop. A couple of shallot “hearts” accompanied the wild rice and they added a slight spice to the sweetness of the squash. The shaved Brussels sprouts were delicious, with great flavor, and offered a slight crunchiness to the dish. Service was fantastic. My server is the benchmark for others in MSP, he knew the menu, was comfortable in making recommendations and if he did not have an opinion of an item that was added that day he was honest. He recommended the swordfish and I was incredibly grateful since it was delicious. 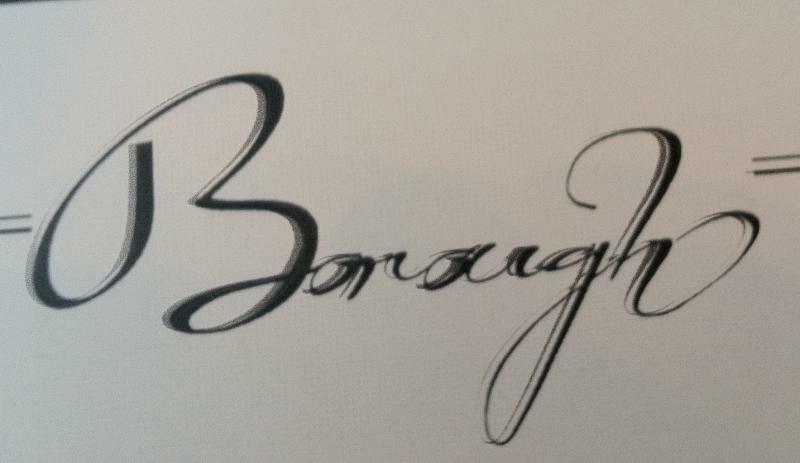 Borough is a great place for some incredibly creative dishes in a very cool atmosphere. This entry was posted in Minneapolis and tagged Borough, Jeff Schlesinger, jfood by jfoodeats. Bookmark the permalink.